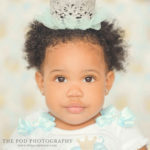 Pasadena First Birthday Photography - Los Angeles based photo studio, The Pod Photography, specializing in maternity, newborn, baby, first birthday cake smash and family pictures. 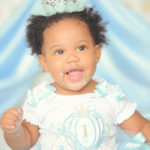 Cake smash sessions are always a blast! 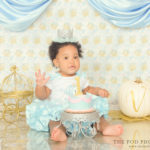 We always have so much fun styling for a photo shoot and incorporating the first birthday theme into the portraits. 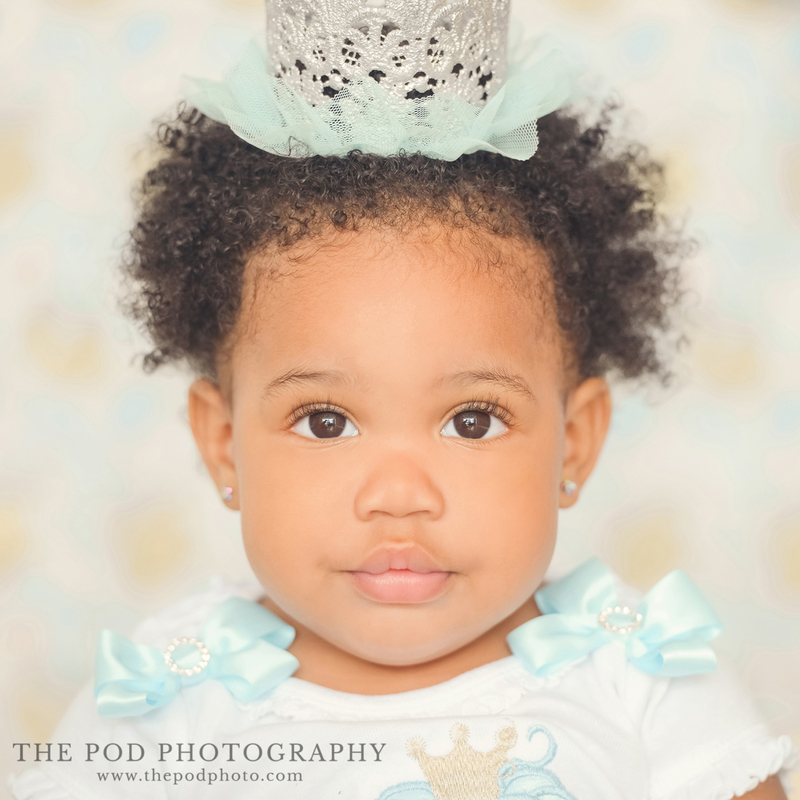 Beautiful Miss Vivienne was so good for her Pasadena First Birthday Photography session with us! 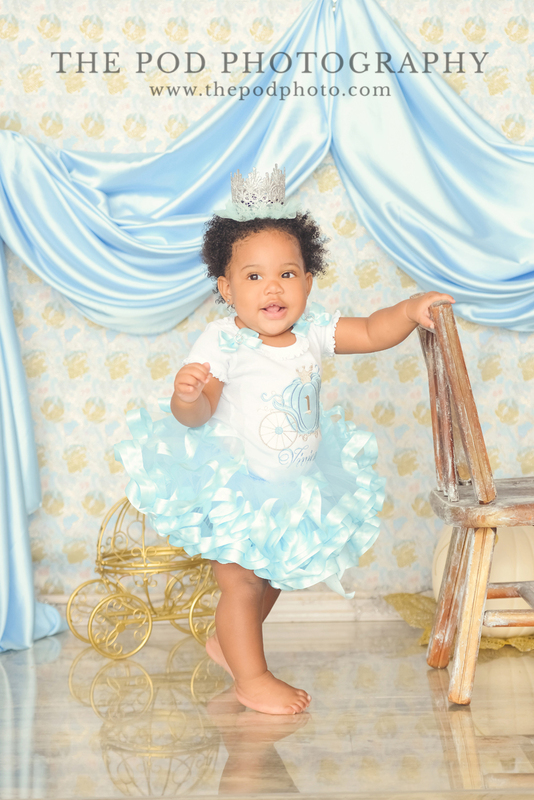 We loved her Cinderella princess theme and how involved her Mom was in the styling. 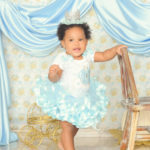 She got her a custom outfit on Etsy, along with a little gold carriage and personalized pumpkin. 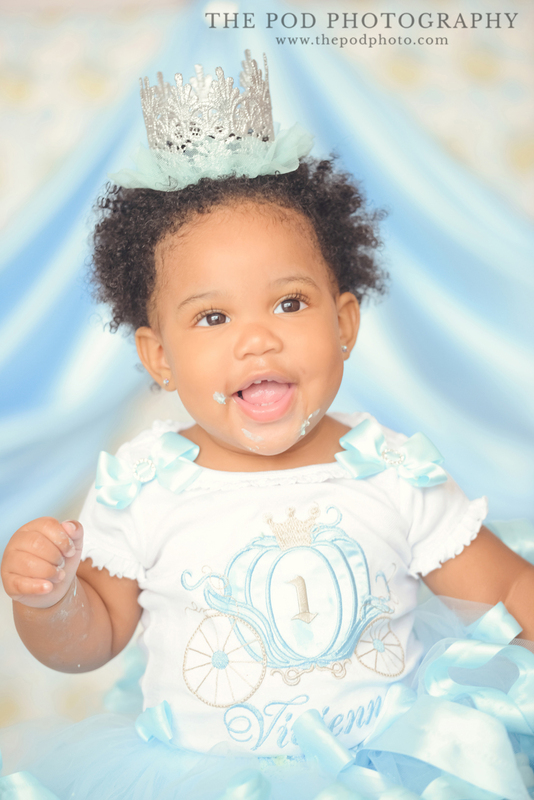 We always love getting a few “clean” shots before beginning the cake smash portion of a Pasadena First Birthday Photography session. 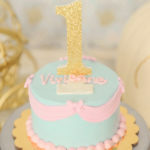 That way, mom has something timeless and classic that she can hang up on her walls – before getting all messy with cake! 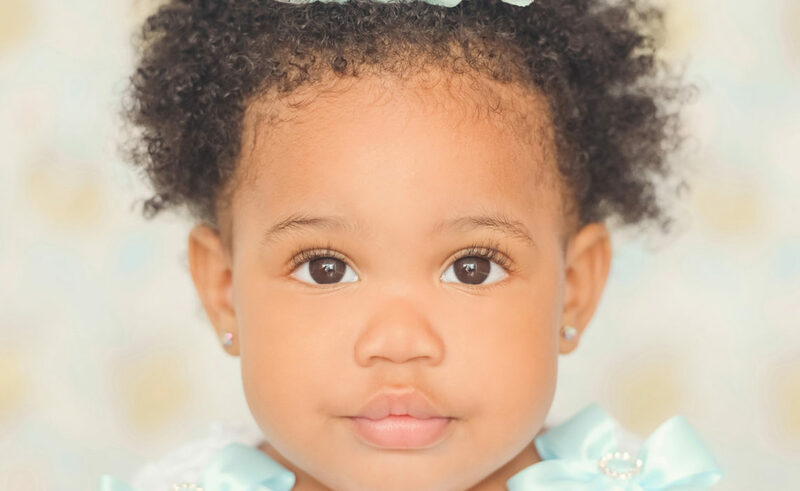 Our favorite from this whole portrait session is the close up, serious shot. 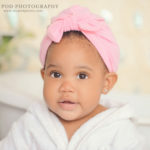 How gorgeous is that little face of hers!? 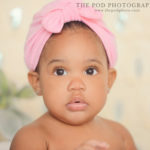 With those big beautiful eyes, chubby flawless cheeks, and kissable lips!! 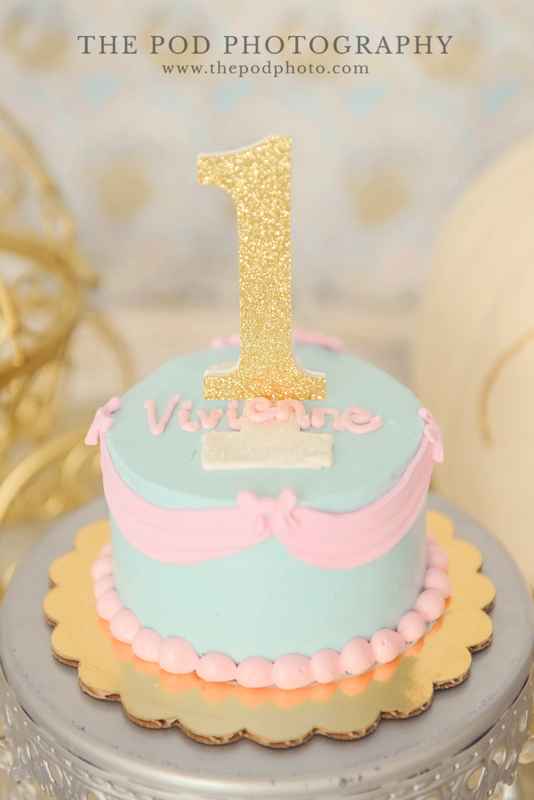 Paired with our gold-textured background and perfect princess cake from Top Tier Treats, this Pasadena First Birthday Photography session was gorgeous! 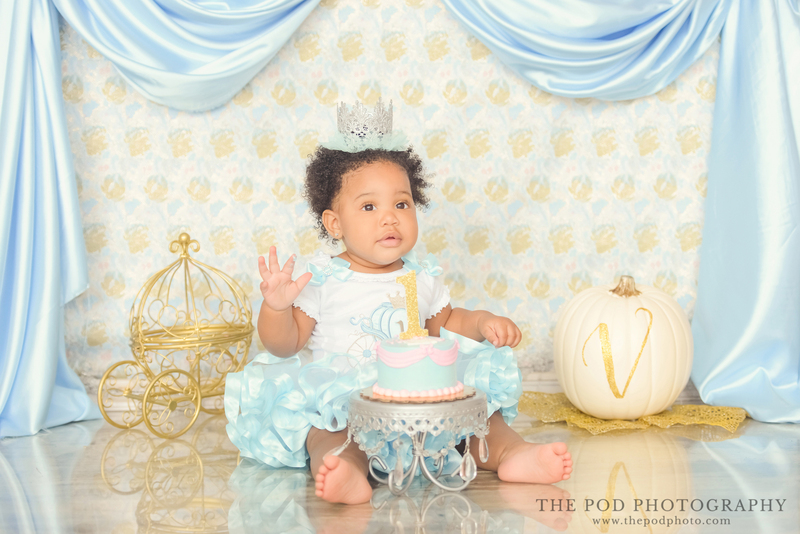 We loved the draping of the Cinderella Blue satin in the background and how it matched the texture of her smash cake. But getting messy is only the start of the fun! What has a cake smash session be even more adorable? 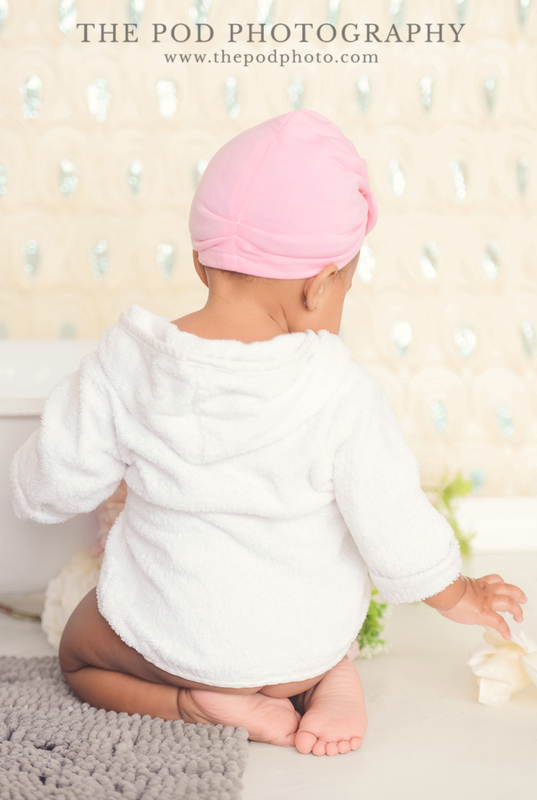 Clean up time! 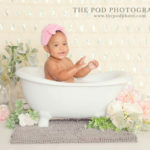 Even more of a favorite than the cake smash, our Pasadena clients LOVE our miniature bathtub! 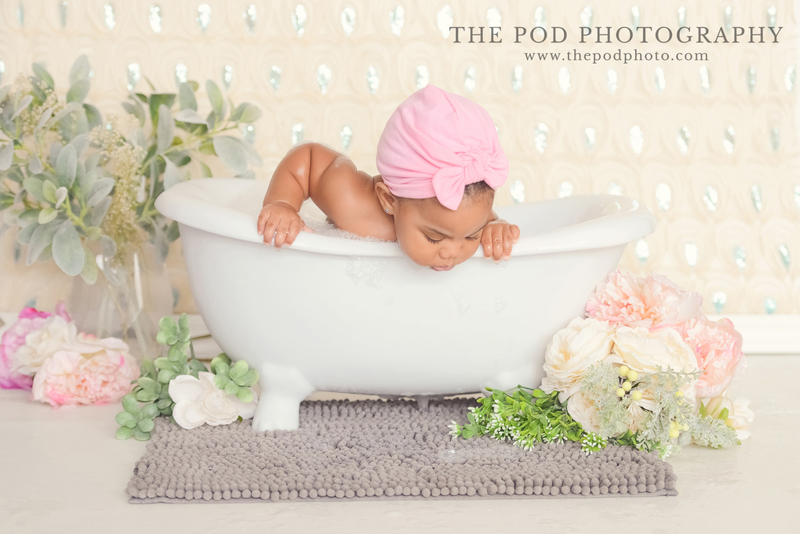 The bathtub set is one of our most popular setups that we do at our Pasadena First Birthday Photography studio. 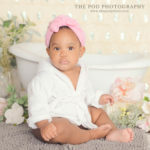 And there is no doubt about it that cutie pie, Vivienne, looked so stinkin’ adorable on this set! I mean, the setup is cute. It’s a baby in a miniature tub (thanks, Denny’s Manufacturing!) 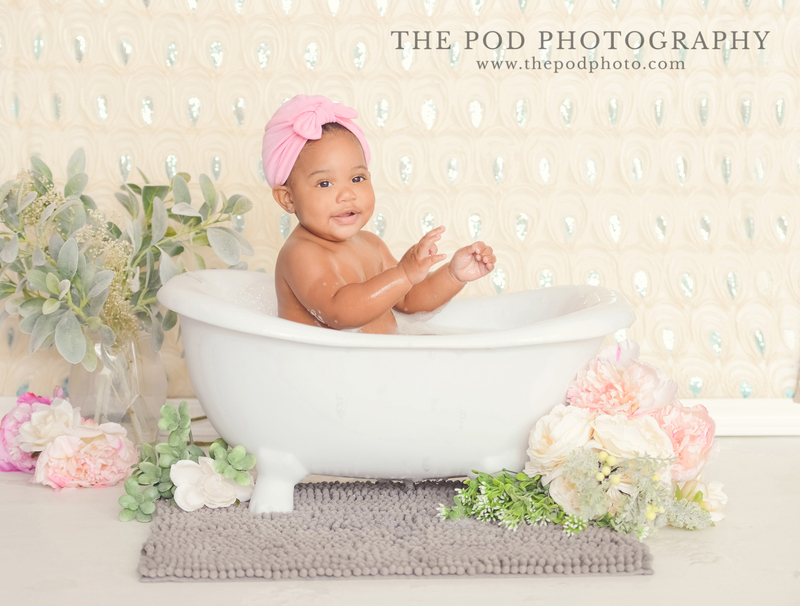 The little glimmer of sparkle, the floral and greenery elements… it’s all great. 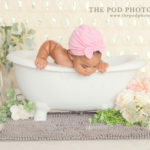 But Mom certainly brought the finishing touch with this bath turban! I mean, seriously. 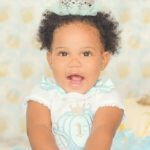 Can you get ANY cuter? 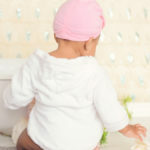 A baby bath turban… baby bathrobe… baby bath tub… and a baby!? 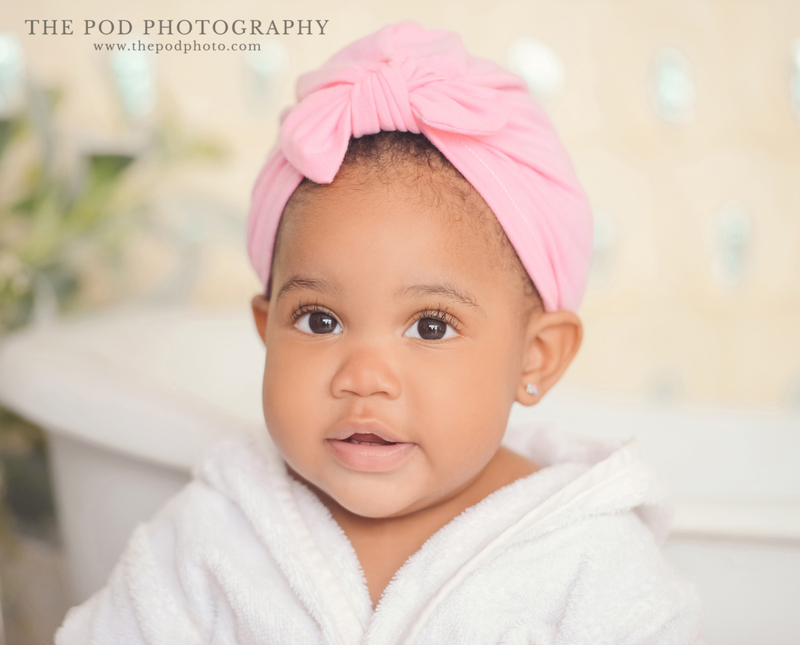 My gosh, the combination of these things is just ridiculously cute. We hope that you can stand it – because we hardly can!! 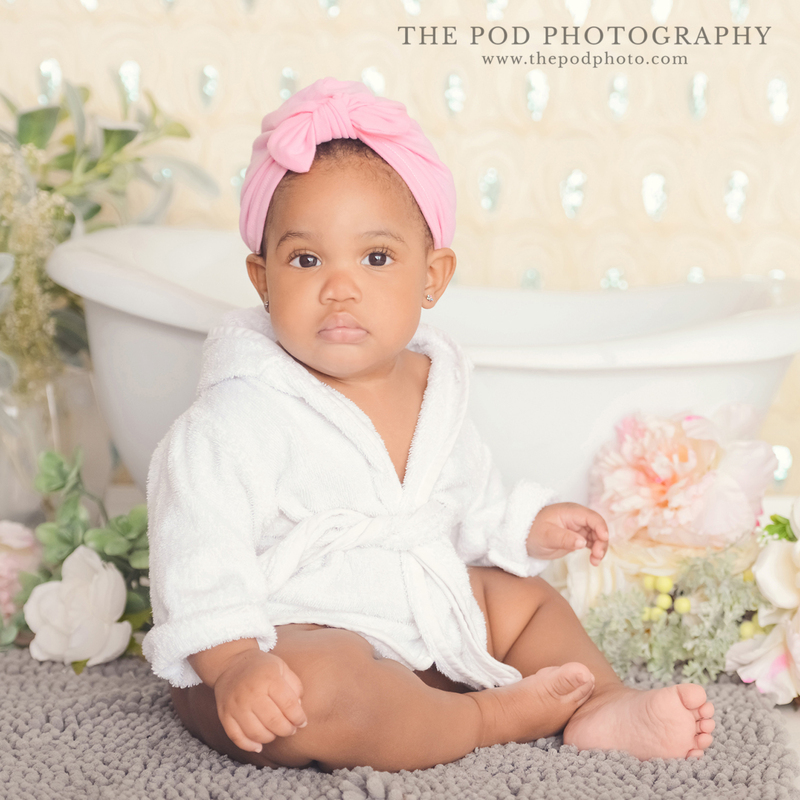 Thank you Vivienne, for your sweet, sweet personality and beautiful images! 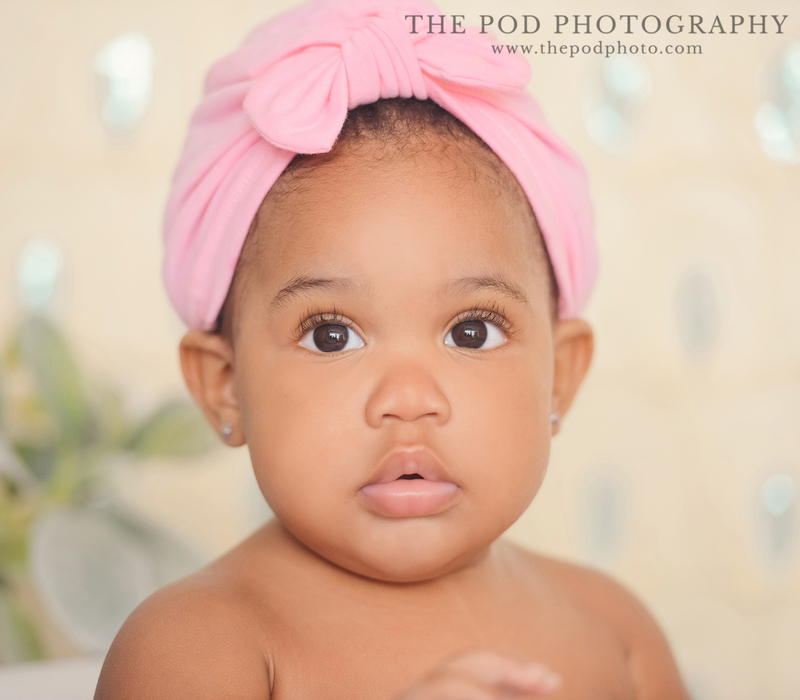 Interested in having us document your little one’s big milestone? 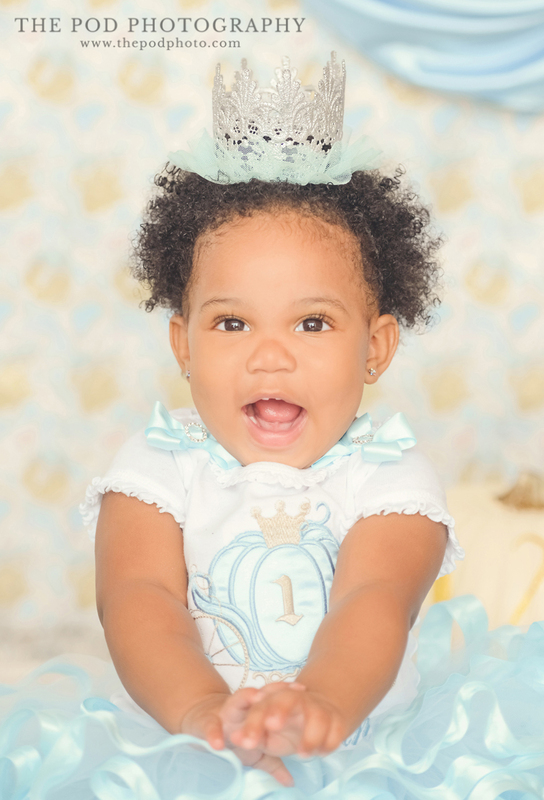 Call our Pasadena First Birthday Photography studio at 310-391-4500 to speak with your photographer and begin planning today! Follow us on our Blog, Facebook, Instagram and Google+ to see what we’ve been up to, or explore our YouTube page for more!